My relationship with the Mario Party series is one based on love and hate in equal measures. Love from getting a group of friends together and laughing the night away as we play mini-games and hop around a digital board. Hate from those same friends screwing me over and snatching away my hard earned Stars. It’s a game where luck can lend a sneaky hand whether you like it or not but when all is said and done, everyone involved often has a good time. Super Mario Party marks the first entry on the Nintendo Switch, a console built for these types of multiplayer experiences so surely it’s a home run, right? Has Nintendo tapped into said potential though? When it comes to content, Super Mario Party is packed. Mario Party mode is perhaps the one fans have had their eye on, with early impressions seeming to hint at a return to the much-loved free roam board game style. To its credit, this mode definitely feels more in line with those older games – everyone is free to move about the board on their own earning coins and chasing randomly placed stars. As was the case before, Stars trump coins in terms of worth but you’ll need coins to purchase them. The boards too are littered with the usual assortment of spaces that both punish and reward anyone who lands on them. Every turn – of a 10, 15 or 20 turn game – even ends with a mini-game (more on those later). Bottom line, fans should feel right at home. Super Mario Party does inject some change to the formula in a few interesting ways though, perhaps the biggest being how it handles dice rolls. As well as a standard one through six dice, every character – which includes easily the biggest and most varied cast the series has seen to date – now comes equipped with their own unique ones too. Mario’s, for example, offers a decent all-round dice removing the numbers two and four and replacing them with threes. Bowser’s meanwhile features sides that can strip coins away or allow you to move a massive 8, 9 or even 10 spaces. Certain spaces also allow you to recruit other characters and use their dice too. It’s a neat mechanic and one that has you not only think about your character choice but also when to play which dice. The boards themselves also feel tighter and perhaps a little smaller in scope. Sure, they’ll still allow you chances to screw over your opponents, purchase items and fall victim to that all too familiar Mario Party bad luck, but overall lack that same expansive and creative feel boards of past games have had. Still, it does make for a snappier feeling experience with fewer events to wade through. While Mario Party is your vanilla-style free-for-all mode, Partner Play pits you in teams of two. Boards now sport a grid-based layout with players combining their dice rolls and able to move independently from one another. It’s a neat twist on the standard mode that allows for some rather strategic play. River Survival is a really cool idea that focuses on teamwork. In it, four players each paddle a giant raft – using motion controls – down an Outrun-esque river complete with splitting paths and obstacles. With time ticking away, you’ll need to participate in co-operative mini-games scattered throughout your journey in order to extend your timer. The better you perform as a team, the more seconds you’ll receive. While fun the first few times, due to a small selection of mini-games and a general lack of difficulty – we never failed making it to the end of the river once – the whole process can start to feel a little repetitive. It’s a shame really as with a bigger pool of mini-games to play and tougher requirements this could have been fantastic. Whereas Sound Stage is a set of 10 motion and rhythm-based mini-games played in groups. The winner is simply the player who manages to keep to the beat best. The games are pretty fun but, again, with only 10 of them, you’ll fly through the list very quickly. Challenge Road attempts to morph the mini-game compilation into some sort of single player experience but feels flat and uninspired. You’ll make your way through a series of linear maps, tackling every single mini-game one by one each with certain requirements such as finishing first, reaching a certain number of points or never getting hit. Besides the odd bit of banter between characters along the way, all this really feels like is a tedious gauntlet that loses its appeal long before you reach its finish. Then again, you could argue that Mario Party has never been about playing alone. And then there’s Toad’s Rec Room that houses four unique games that can make use of two Switch consoles in portable mode together. They’re impressive in their execution, especially Banana, Split that sees you physically moving the consoles so that you can piece together a banana between the two screens. Unfortunately, each device requires a copy of the game (not an easy ask) but you are able to play smaller single screen versions of three of the four mini-games – whether that be striking home runs in Mini League Baseball, working as a team in Puzzle Hustle, or battling it out in tanks in Shell Shocked Deluxe. Rounding off the extensive list of modes is an option that allows you to focus purely on the mini-games either cherrypicked or in two other ways. Mariothon is the more interesting inclusion since it also allows for the first time in series history players to go online. Essentially a set of five preset mini-games, points are awarded based on your performance in each, the winner then crowned at the end. But it still comes as a disappointment that Mariothon is the only mode able to be played online, especially given how fun it ends up being. Of course, a Mario Party game is only as fun as the mini-games it packs and, fortunately, the selection on offer in Super Mario Party is a strong one that makes great use of the Joy-Con’s numerous features. Take Candy Shakedown for instance where the aim is to simply shake the Joy-Con just right in order to get a bunch of sweets out of a glass bottle. Or Rattle and Hmmm, a mini-game that sees players trying to guess an enemy based on its rumble of the Joy-Con. Super Mario Party manages to keep things interesting with its range and overall quality of mini-games whether two-vs-two, one against three or a simple free-for-all battle. What’s more, its use of motion controls rarely feels tacked on, the game knowing when traditional button and analog is a better solution. And sure, there are a few dull mini-games here and there – there always is – but these are few and far between. Super Mario Party has a lot of content going for it, however, its method of giving you access to it all is a slow and confusing one. Right off the bat, you’re earning Party Points to unlock extra goodies (which were eventually revealed to include music, stickers and tips), however, the game doesn’t explain nor give you the chance to do this until many hours in. Gaining access to new characters also left me scratching my head as they would randomly appear in the game’s hub with no introduction. Perhaps the most perplexing of all though is how you go about unlocking Challenge Road, the game tasking you with first unlocking every mini-game. It’s these strange choices that left me feeling frustrated rather than rewarded as I gradually received new content. The game is absolutely gorgeous from a technical standpoint, everything from the character animations to the level of detail in the environments is among the best the series has seen. Taking one look at the cube of meat in Sizzling Stakes I couldn’t help but comment to the group, who were all in agreement, that’s some damn good looking food. 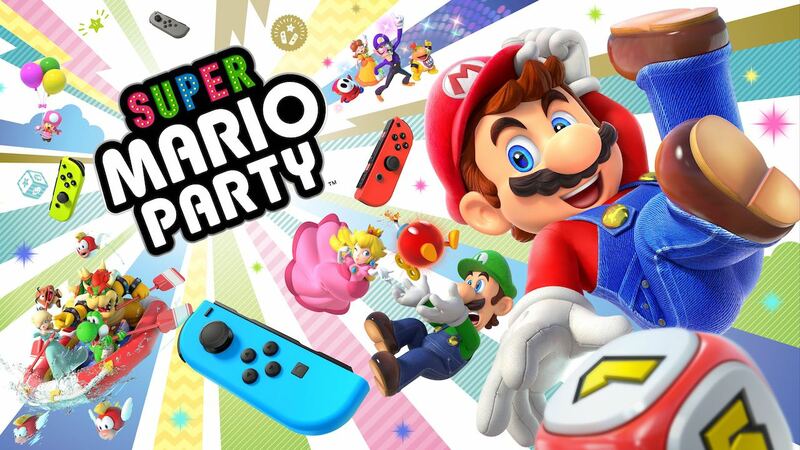 Audio-wise Super Mario Party’s music is serviceable with the odd remix here and there while the cast of characters will make the familiar calls and yelps during turns and mini-games.